A tourist starship is under invasion by monsters. They take human form and are picking off the passengers one by one. The bravest civilians take up arms and fight back. But first, they must figure out who are the monsters. Alawar Premium and development studio Cheerdealers will be ending their beta period this week, and will be launching ‘I am Not a Monster,’ on Steam this Thursday, September 27th. 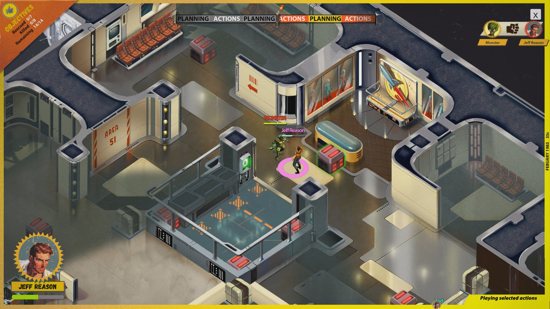 The turn-based, tactical multiplayer is set in a 50’s Sci-fi Retro with each PvP session featuring a group of up to six players, where every player is randomly assigned the role of civilian or monster, with a maximum of two monsters. The game also hosts a range of Mafia/Werewolf party game style features. Players are encouraged to invite friends via steam chat here and grab the game to try free for a limited time during ‘Free Steam Weekend’ going on Sept 27th-30th. After the free weekend and initial launch discount week ending on Oct 4th, players can pick up the game at $12.99 USD. Watch out: infected by a monster, civilians have just a few moves to heal, or they turn into monsters themselves. Check the boxes around the starship for weapons and tools. Combine loot to gain a unique ultimate ability that you can use to turn the tide of battle. Learn your enemies' strategy and adapt to it. Take part in conversations and gain civilians' trust. Infect the passengers to re-spawn if you are disclosed and killed. What to expect in the full release, and more! Any in-game purchases, Day 1 DLC, a Season Pass, Early Access.